Arriving in Egypt, whether coming from the sea to the dry land or from the desert to the kindly land of the Nile, is an experience to be savored. The Nile came out to meet the traveler from the Mediterranean, as the French statesman Chateaubriand noted. 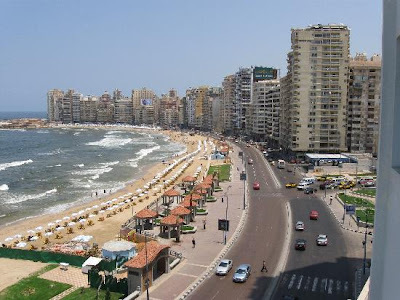 To some other travelers, Alexandria was their first meeting with the ‘East.’ Whether arriving from East or West, Alexandria, with its ancient buildings, its history, and its kaleidoscope of peoples, fascinated all who came. On 20th October, at five in the morning, I perceived, upon the green and ruffled service of the sea, a line of froth, beyond which the water was pale and placid. The captain came up, and tapping me on the shoulder, said, in the Frank language, "Nilo!” It was not long before we entered the celebrated river, whose water I tasted and found salt. Some palm trees and a minaret indicated the site of Roetta, but the land itself was still invisible. This coast resembles the savannahs of Florida: its appearance is totally different from that of the shores of Greece or Syria, and strongly reminds you of the effect of a tropical horizon. At ten o’clock we at length discovered, below the tops of the palm trees, a line of sand running westward to the promontory of Aboukir, which we should have to pass in our way to Alexandria. We were then exactly facing the mouth of the Nile at Rosetta, and were going across the Bogaz. The water of the river in this place is red, inclining to violet, of the colour of a moor in autumn. The Nile, whose inundation was over, had been for some time falling. It was eleven o’clock at night . . . when we came to anchor in the commercial harbour, in the midst of vessels lying before the city.